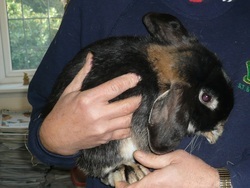 Franklin is a fawn and brown dwarf lop. He was abandoned with his brother Aubrey by his previous owners who went ‘on holiday’ and didn’t return! We do not know how old he is but we believe he is quite young. He has been neutered and so will be looking for a new home at the end of January.